Liftech utilizes AB Chance and Atlas foundation Systems that offer an alternative to traditional piling or anchoring systems. AB Chance is the first and most trusted brand of foundation systems in the industry. 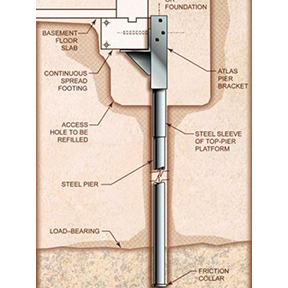 Helical piers, also referred to as piles, are deep foundation steel pins used to secure new or repair existing foundations. Resistance piers are hydraulically driven sections of steel pipe that can be driven through unstable soil into load bearing strata. 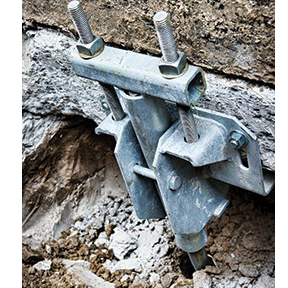 Wall anchors and braces can help prevent wall movement by holding the wall when soil swells and the resulting pressure pushes against the wall. 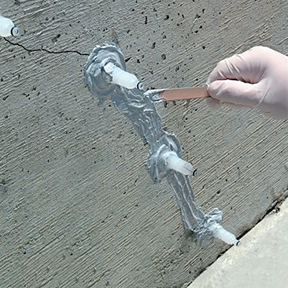 Cracks allow moisture and other contaminants to infiltrate the concrete compromising it’s structural integrity. we serve towns along the I-25 corridor, in the mountains, and beyond. With over 7,500 satisfied customers and the honor of being Colorado’s No. 1 rated concrete stabilization company, we’re your best choice to keep your home stable and strong for years to come. Learn more about our services below, and get a free on-site estimate. Ultimately, foundation repair is daunting, but it’s necessary to preserve the safety and monetary value of your home. With Liftech, you’ll get effective and industry-leading foundation repairs, excellent customer service, and the option for special financing plans so you can have peace of mind. When gravity pushes down on large volumes of groundwater around your foundation, it increases hydrostatic pressure within the soil. This places lateral pressure on your foundation, which can cause it to shift and crack. Heavy rain and snowmelt can eat away at the soft soils around and under your foundation — and over time, this can create voids that will cause your home to shift laterally or “settle” deeper into the ground. Hot weather can sap soil of its moisture — and much like a kitchen sponge drying out on your counter, the soil will shrink and take up less space. When soil around your foundation dries out and shrinks, it leaves voids around your foundation which can lead to sinking, settling, and shifting. The expansive root systems of large trees and plants can push against your foundation and even make their way under your foundation in search for moisture. This is often the cause of shifting and small, concentrated cracks. Root systems can also contribute to previously mentioned causes of foundation problems, such as erosion or soil shrinkage. Entire subdivisions and individual lots within them are often over-excavated in preparation for new homesites. This may also include the mixing of soils to equalize them and re-compacting them prior to structures being placed on top of them. When a foundation is not poured on stable soils and/or properly engineered to account for shifting soils, this can lead to lead to movement in the overlying structure. Expansive clays, including Bentonite, are found throughout Colorado’s Front Range. In areas with high concentrations of clay, the ground can swell, lifting everything on top of it, foundations included. When not planned properly and graded correctly, the overall drainage in subdivisions and within individual lots can cause water to flow towards the structure, instead of away from it. 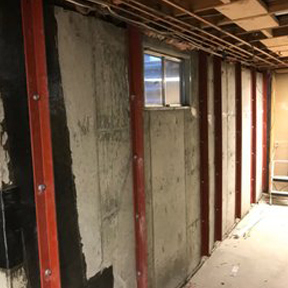 Years of water intrusion around a structure can not only lead to potentially harmful moisture issues (e.g., mold), but also cause the foundation to shift and move. Expansive clay, loose or improperly compacted soils, and improper grade and maintenance of the soils around your home are just a few potential causes of structural failure. Denver, Boulder, and other areas up and down the Front Range contain high levels of bentonite, which often contribute to movement in the structure and foundation failure. Older homes and homes that don’t have additional structural support (piers, footings, etc.) are often adversely impacted by high levels of expansion and contraction in the soils over time. 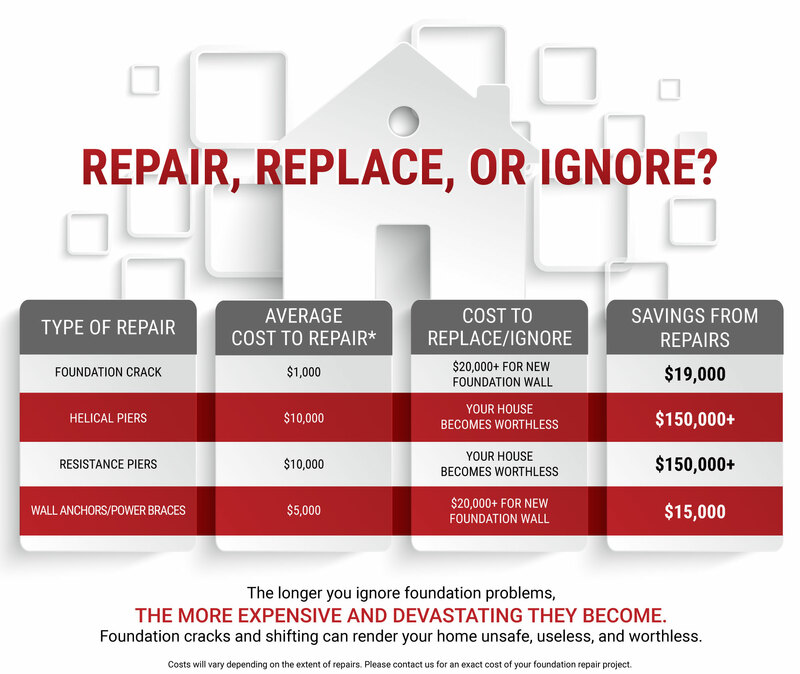 Without a solid foundation, your home might be a ticking time bomb for larger, more expensive repairs if left unaddressed, or worst-case, you can be left with an uninhabitable (and worthless) structure! Contact us today for a free evaluation of your foundation repair project! Stair stepping in bricks: As a home shifts and the foundation moves, often you will see the exterior brickwork or siding start to break, and cracks will develop in the mortar between the bricks. Often the cracks will “stair step” up the exterior of the house. Cracks in the foundation – Hairline cracks in a foundation are fairly common as even the best constructed homes move slightly over time. But larger horizontal or vertical cracks that are greater than 1/8 inch or have lateral separation between them are usually signs of significant movement in the foundation that should be repaired. Sagging rooflines – Movement in the areas supporting the roof (interior/exterior walls, pillars, trusses, etc.) will transfer to the overlying roof and you will often see sagging or crooked roofs develop. Bowing & leaning walls – A leaning and moving foundation means that the walls sitting on top of that foundation will move as well. Often you will see the exterior walls fall “away” from the house. If the foundation breaks and moves laterally, walls will often bow in or out depending on the movement in the underlying foundation. Leaning chimneys – Many times chimneys are either tied to the foundation or they are sitting on their own footing. As the foundation or footing under the chimney shifts, without proper support the overlying tall & narrow structure of the chimney will start to fall away from the house leaving a potentially hazardous situation at your home. Crooked garage frames – Garages usually sit on foundation walls or footings and as settlement occurs in those areas, the overlying structure of the garage will twist and bend leaving the frame of your garage crooked. Often you will notice this when your garage door doesn’t seal properly along it’s perimeter or won’t open or close properly without binding up in the tracks. Sagging & uneven floors – As the foundation that the floors sit on begins to move, the floors themselves start to sag and bend. Do you feel uneasy when you walk across your floors? Are there ridges under the carpet or areas where your tile or wood flooring have cracked or separated? Do the floors squeak and crackle excessively when you walk across them? These are all tell-tale signs of foundation movement in the home. Many times you will see the movement in the floors will “transfer” from the ground level to the upper floors. Cracked & bowed walls – Similar to the exterior walls, interior walls will flex, bend and break as the structure begins moving. Often you will see large drywall cracks develop in the corners of rooms and around door and window frames. Drywall seams become visible as the large panels shift and move. Doors & windows that won’t open/close – Probably one of the most common signs of settlement is doors and windows, both interior and exterior, that won’t open, close or latch properly. Looking at the frames for the doors and windows, you will see they are out of alignment with uneven gaps along the top, bottom and/or sides when shut. Rubbing on the floors and around the frames is common and the homeowner often re-trims these areas instead of addressing the underlying problem (which will likely come back!). Drywall cracking – Small hairline drywall cracks inside a home are to be expected, but if the cracks you are seeing are worsening, spreading and are generally more than 1/8 inch, the foundation is likely on the move. As the home twists and turns, the large rigid surfaces like drywall will ultimately bend and break. Many times homeowners patch these cracks but they almost always return! “Popping” sounds – Does it sound like movie theater at night with popcorn popping in your kitchen? Are you convinced that you live in a haunted house with all of the creaking you hear while you are lying in bed? Well, you probably don’t need to call Ghostbusters, but your home is indeed groaning from the uncomfortable movement it is experiencing. Constant cracking and popping sounds that appear to worsen may indicate you have some more sinister problems going on other than ghosts! Regardless of the cause, foundation movement left unattended could not only cause serious damage to the structure of the home, but it may even render it unsafe, useless and worthless. Homes in need of structural repairs are often impossible to sell except at “fire-sale” prices. Banks often won’t lend on homes with serious structural issues either. And cracks in the foundation and leaky windows and doors can lead to bigger problems with water infiltration and exorbitant energy bills! Do not wait until it’s too late to address these problems. Contact us now for a free evaluation. WHAT TYPE OF REPAIR DOES MY HOME NEED? Once our highly trained personnel have evaluated your home and put together a bid for your repairs, we will offer you a comprehensive plan involving some or all of our available Foundation Repair Services. For more information on these services, please visit the links below! Ready to schedule your free evaluation? PLEASE VISIT OUR FOUNDATION FAQ PAGE FOR ANSWERS TO THE MOST COMMONLY ASKED QUESTIONS REGARDING FOUNDATION REPAIR PROJECTS! WHAT CAN I EXPECT FROM A FOUNDATION REPAIR WITH LIFTECH? 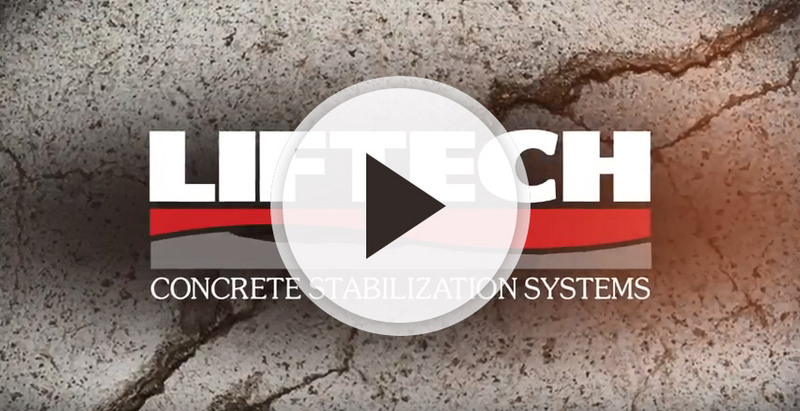 The foundation repair process is simple with Liftech at the helm. We start with a free on-site evaluation of your foundation, and provide a written proposal with a list of necessary repairs. This proposal is good for 90 days. In more serious circumstances, a structural engineer may be called to your property for a more thorough evaluation. Once a plan is set in stone, the Liftech experts will begin the repair process, which typically takes two or three days — although in certain cases, like when helical piers are installed or any landscaping is removed in order to excavate, the process will take longer than three days. After repairs are complete and your landscaping is restored, your home will be in a “relaxation” mode — a period of roughly 90 days when it will adjust to repairs and settle into place. Avoid fixing cosmetic cracks in drywall until this period is over. What is the correct course of action to repair my foundation? 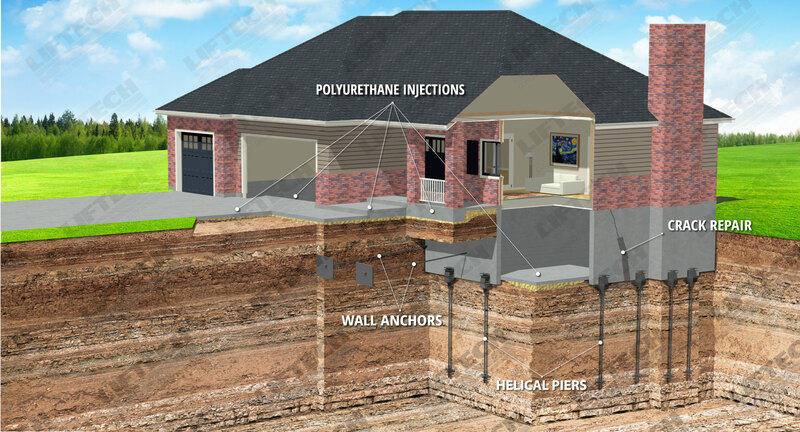 There are plenty of options for repairing your home’s foundation, including the use of helical piers, resistance piers, lateral braces, and crack repair. The specialists at Liftech will create a repair plan based on the overall state of your foundation, soil conditions, foundation construction method, and several other factors, and they’ll give you a concise and transparent look at the logistical and financial aspects your foundation repair. Why is foundation repair so important? Foundation movement that isn’t addressed early on can lead to irreversible damage that makes your home unsafe, uninhabitable, and even worthless (a lot of folks who have irreversible foundation damage must sell their homes at “fire-sale” prices). While we’ve all heard about “totaling” a vehicle, serious foundation damage is essentially the “totaling” of a house — too much damage or movement, and there will be no possible way to stabilize the foundation and reverse the damage that has been caused. Fortunately, these devastating problems are completely avoidable if you have a keen eye, a proactive mindset, and a trusted foundation repair and concrete lifting team like Liftech at your disposal. Get your free on-site estimate today, or give us a call if you have any questions. How do I know if I’m at risk for foundation damage? If you notice any of these signs in your home, feel free to give us a call. We’re happy to provide a free examination of your foundation to diagnose any potential foundation problems. Will foundation repair create new cracks? Will it fix my old cracks? Every home is different, so every home will react to foundation repair in different ways. In some cases, existing cracks will close if there is no dirt or debris inside of them — but in other cases, new cracks will emerge and existing cracks will remain open. Ultimately, cracks are a cheap, mostly cosmetic problem, while foundation settling and shifting is an expensive, house-compromising problem. Foundation repair experts will focus on stabilization before they they focus on lifting and cosmetic repairs. Once the foundation is stabilized, there are plenty of crack repair methods that can get your floors looking a beautiful as they are stable.